I don't have a Valentine this year, so I've decided to treat one of my lovely readers with a gift instead of some guy. If you think about it, it makes sense. You all are the ones who listen to me ramble about my life and who support me through everything, so why I wouldn't I want to spoil you? Luckily, Alana of the Etsy shop, Make Pie Not War (who I featured in a post recently), has offered to help me out with something pretty. One lucky reader will one a Double Heart Goodness necklace from her shop just in time for the big day. 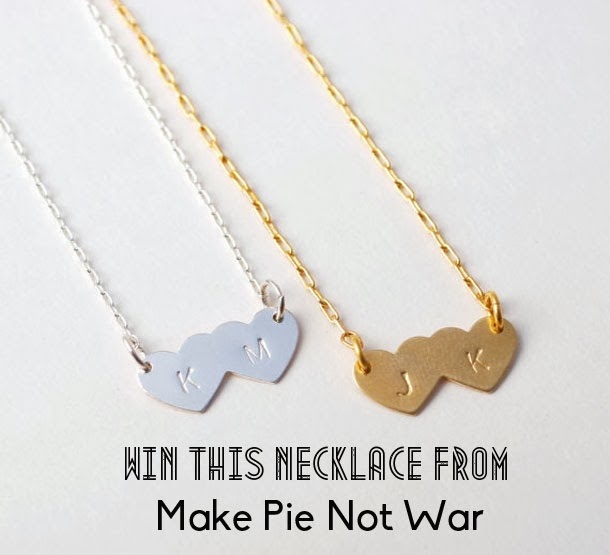 I'm in love with pretty much everything from Make Pie Not War, and this necklace is particularly darling. All you have to do is enter through the Rafflecopter widget below. While you're at it, make sure to check out Make Pie Not War, especially since Alana is also offering my readers 15% off until 01/31 with the code room334. Good luck and happy shopping! This giveaway is open internationally and will run until midnight on 01/28. 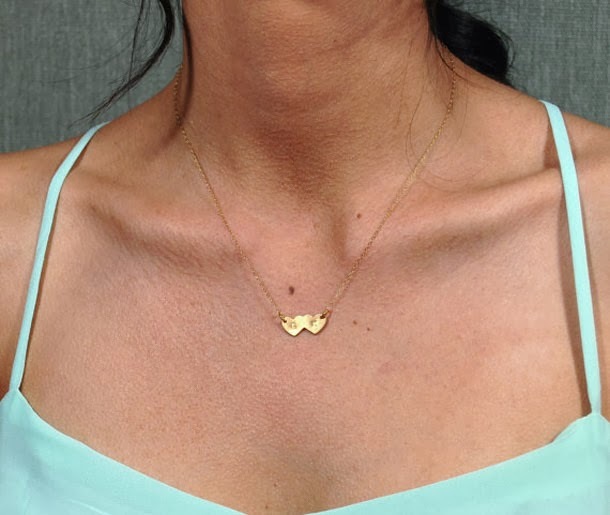 gosh i am soooo in love with the seven tri love brass gold filled necklace! Oooh, the double heart necklace is too cute! I also love the skinny band rings! I want to start wearing more simple rings on more of my fingers. I love that look! Oh this shop is adorable! I love the double heart necklace you're giving away, but I also love the single heart initial one! I like the Ampersand Rose Gold Bracelet. Thanks! Pfft! Who needs boys?! 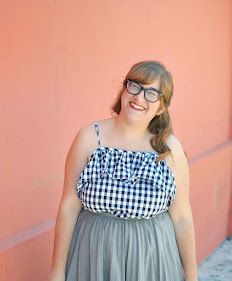 Cute post and those necklaces are the most precious dainty things ever! I love the long bar necklace from make pie! PS- glad you're doing this giveaway, I'm new to your blog and love it! I adore this Double heart goodness chain in rose gold! She is so talented and has so many wonderful pieces to choose from! I love the Too sweet heart gold silver rose gold necklace. I love the itty bitty bar necklace! The constellation vacation earrings are pretty rad! Ooooh! Such a fun giveaway! I love the 3 if I had three sides necklace AND this one. So cute! I really love "my favorite hoops" but this one is also gorgeous!! I love this giveaway! It's a nice idea to focus on gifting, even without a significant other to spoil you. On another note, I just found your blog and now I'm following. I hope you check out my blog and follow back. This is a great giveaway! (and especially apt after our discussion on my post today about "being spoiled" :P) My fave item would have to be their "bar necklaces" with the initial carving. $47.00 USD! All of these items are so nicely made. Thank you for the chance to win! I love the ampersand bracelet! This necklace is darling, though I think my favorite item from the shop is the ampersand bracelet! Adorable! I love the teeny tiny heart ring and the fox necklace! but so many lovely items! I've been looking for a dainty necklace for everyday wear, and this one fits the bill! My favourite is the "over the moon silver rose gold necklace" super cute!